Digital marketing is a challenging task and needs consistent analysis and revamp to stay ahead. Part of the challenge lies in understanding how Google algorithm ranks sites and how competition runs marketing promotions for their business. And then comes the business executives questioning the revenue generation against the money invested. 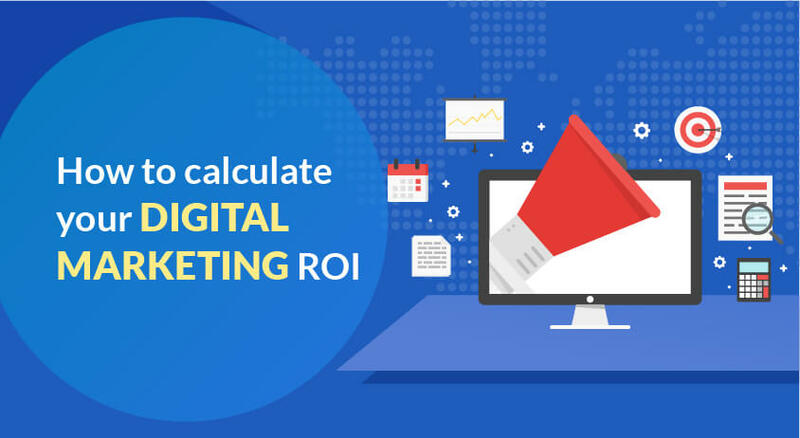 So, how to calculate your digital marketing ROI? The rudimentary analysis involves measuring site traffic, user engagement and feedback. But let’s start with the metrics involved in various digital marketing services that includes website landing pages, emails, social media campaigns and brand awareness. The major metrics involved in website landing pages are site traffic, unique visitors, time spent per visitor and conversions. With Google Analytics, begin your analysis with site traffic to know how many users paid their visits during the campaign. It can then be narrowed down to the number of unique and repeated visitors. Parallely, measure the page visits after the landing page to know if the page traffic is redirected to the correction CTA (Call-to-Action) page. It is important to note down the time spent by each visitor to understand whether the page content is engaging with the user. Conversion metric should be measured to know if the purpose of the landing page is achieved or not. Identify the cost-per-conversion. Here are 8 eCommerce conversion killers you should watch out. For paid traffic, cost per lead is based on AdWords campaign and for organic leads, you can analyze the leads generated against the investment in SEO/content marketing efforts over a particular time period. In general, ROAS (Return on Ad Spend) is also a good metric, but without fixing the profit margin, it may be difficult to calculate. Metrics for social media marketing, you need to focus on CTR (click-through-rate) and engagement ratio. The real measurement of CTR is in knowing the number of users who click the CTA button instead of knowing how many times the ad has been shared or liked. A commendable engagement ratio solely lies with the relevancy of content for the target user. Based on these metrics, you may have to frequently revise the engagement strategy. Email is the primary method in digital marketing services to engage target audience. Email acts as a communication bridge between a brand and its consumer. Metrics to measure ROI in email campaigns include open rate, bounce rate, click-through-rate (CTR) and conversion rate. Let’s look at how each of these metrics can be revamped. Open rate can be improved by choosing the right email template. Personalized subject lines with the customer’s name increases open rate by 26% and revenue by 73% while listing non-relevant products in such emails can disappoint 74% of customers. An updated email list of your customers will bring down bounce rates. To improve conversion rate, refer the purchase history of customer and select products in the ‘purchased’ category. For CTR, create better ad copies, focus on keywords and use A/B testing frequently. Brand lift is a useful metric to measure the level of brand awareness among the target users. Using Google Analytics, look for the search queries (numbers) that directly include the brand name for a particular period (eg: month). The number of queries should gradually increase as a result of your overall digital marketing efforts. Metrics are crucial to understanding whether the money spent on ads and marketing efforts translate to profitable ROI as expected. Metrics indicate the quality of customer experience and brand awareness. In the end, they set a path ahead by providing insights on where more efforts are needed and other improvement regions. Do you think we have missed out anything important or are you looking for a free initial assessment? Contact Us and learn about our eCommerce Marketing and Development Support Plans! We have an integrated onboarding process for marketing and development while providing maintenance and support using agile methods in project management.